In 2010, Clowns Without Borders Spain and Clowns Without Borders USA went to Haiti with the support of Handicap International. They performed 32 shows for 3585 people. In 2010, Clowns Without Borders Spain and Clowns Without Borders USA went to Haiti to contribute to improve the mental health of children affected by the last earthquake. They performed 8 shows for 1500 people. In 2010, Clowns Without Borders France and Clowns Without Borders South Africa toured in South Africa and Lesotho. They performed 10 shows for 3500 people. In 2010, Clowns Without Borders South Africa did a performance tour and drama workshops in Soweto. They performed 18 shows for 6658 people. 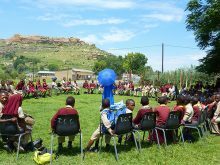 In 2010, Clowns Without Borders South Africa did a performance tour in preparation for a further Njabulo intervention (South Africa). They performed 10 shows for 2011 people. In 2010, Clowns Without Borders Canada went to Haiti to perform 16 shows for the people living in slums and affected by the earthquake. They met in total 27,900 people. 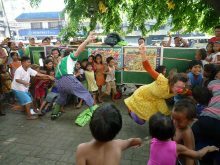 In 2010, Clowns Without Borders Belgium went to the Phillipines to perform 15 shows for 3500 street children. In 2010, Clowns Without Borders Belgium went to Nepal to perform 15 shows for 4000 street children.